Cinecultist:Who Exactly Is The Man On The Inside? Who Exactly Is The Man On The Inside? Lately, Cinecultist feels like we're all about the genre picture. Formulaic Hollywood plots done right with good acting, strong but not flashy camera work, and solid but not cheesy plot sign posts. All roads that away lead to good entertainment, says CC. 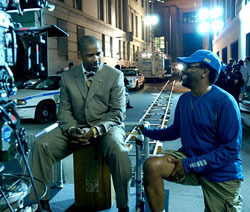 Hence our happiness with Inside Man, a "Spike Lee joint" that Lee directed as a director for hire, aka not a script he developed himself. This is auteur studies at it's most basic, because in these instances a cinephile can sit down with the final product knowing the filmmakers didn't begin with their preoccupations inherent to the project, and thus any trademark flourishes are by products of the director's distinct style. Themes common to Lee's work -- New Yorkers, race, class, 9/11 -- all come into relief here. Plus, we get a few trademark Lee visual touches like a seemingly stationary person propelled forward through space and direct address to the camera. Cinema studies aside, Inside Man is also a super entertaining little picture with great performances and a fun, twisty plot. It should go without saying that seeing Denzel Washington, Clive Owen and Jodie Foster on screen separately, let alone acting together, can be a joy. Each of these performers burrow into their roles and give what could be simple parts impressive depth. Also, the chemistry between Washington (who plays the investigating detective) and his partner, Chiwetel Ejiofer, an English actor less familiar to US audiences, is really solid. And we also need to give props to the costume designer (Imdb tells us it's Donna Berwick) for putting Foster into those fierce suits and heels. Girl looks h-o-t-t. CC can completely understand how her corporate fixer character can bend the will of powerful men when she's dressed like that. Yowza.